Fact: No one has ever looked at a pair of Wingtips and thought they should be more like hideous looking Vibram FiveFingers. Fact: No one has ever wanted to wear Vibrams as dress shoes and wasn't crazy. Fact: Anything horrible should always be burned from this Earth for maximum visual and soul-fueling pleasure. "This partnership sprang from a concept that Vibram owner Marco Bramani had been thinking about. 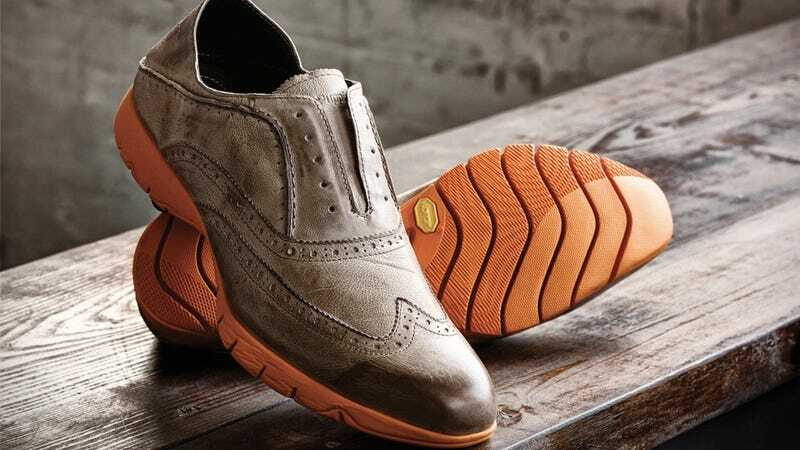 He had personally created a one-of-a- kind Vibram shoe for himself to wear to more formal occasions. The idea seemed like a natural fit for the Hush Puppies brand, and it became an instant marriage of two brands. Marco and his team have been great to work with to deliver this exciting product to the men's market. We are coining the consumer our 'renegade' gentleman, a character that came about organically as we worked out the design and packaging, which has a rogue look and is very exciting."